Bern Pilates of New Bern - News, Events, Special Offers and more! The Reformer. You’ve heard of it but aren’t quite sure what it is. It’s a hefty machine that consists of a sliding carriage rigged with springs, bars and straps. You lie, kneel, stand and sit on the Reformer to create a balanced body and strong core — or “powerhouse,” as creator Joseph Pilates called it. At the spring end of the Reformer, there is an adjustable foot bar to utilize with your feet and even hands during your workout. The Reformer also has long straps with handles on the ends that attach to the top end of the frame and can be incorporated to your workout with arms and legs. Body weight and resistance of the springs are what affect the mobility of the carriage; you adjust the Reformer to your body size and skill level by changing the springs on the machine. So now that you know what the Reformer is, let’s look at what it can do for your body. The benefits of the Pilates Reformer are endless and will leave you wanting more! Full Body Workout. The Pilates Reformer works your entire body through a range of movements targeting groups of muscles in your torso, arms, legs and shoulders. Additional benefits include improved muscle tone as muscles are lengthened and strengthened without appearing bulky. Increased Core Strength. Exercising on the Pilates Reformer requires proper form and technique within the core, your abdomen and lower back muscles. By conditioning the core muscles, they will contract with all movements to stabilize and align your spine. A strong core will increase the effectiveness of all exercises due to your ability to maintain proper alignment. Core strength increases your ability to generate power to your muscles and decreases the risk of injury. Improved Flexibility. Through deep stretches and slow transitions between controlled movements and balance on the Reformer, your muscles will strengthen, and your posture will improve, but most of all your flexibility will increase. Flexibility is vital for your overall health and fitness and will help prevent injuries as you increase activity. Improved Posture. Workouts on a Pilates Reformer will improve spinal alignment. With improved alignment, your muscles will strengthen and increase spinal support and stability. Improved posture will lengthen your joints giving you a taller appearance. Muscular imbalances will be corrected decreasing the risk for injury, especially to the lower back. Awareness of proper posture during exercise will carry over to awareness of proper posture when performing everyday movements. Reduced Body Fat. Exercise increases your metabolism, your body’s ability to burn calories. Increased muscle mass increases the number of calories burned. When the amount of calories burned is more than the amount of calories eaten, excess body fat is burned and used for energy to meet the increased demand. In addition to many of its own unique benefits, the Pilates Reformer can step up the positives a Mat program provides, including better back health, flexibility and body awareness. Check out our schedule and register for a class today. Your body will thank you for it! https://bernpilates.com/wp-content/uploads/2019/03/Reformer-Diagram-1.png 419 500 4l2jd http://bernpilates.com/wp-content/uploads/2015/11/BernPilates-340x156-01.png 4l2jd2019-03-28 09:03:292019-03-28 09:13:08Why the Reformer? Pilates may have gotten the reputation of being a girly workout, but that couldn’t be further from the truth. Pilates was created by Joseph Pilates, and if you look around, you’ll see that some of the manliest men incorporate Pilates into their workouts on a regular basis, either as their primary method of strength training or to complement their regular weight training. Football is one of today’s most challenging sports, and if its professionals see the benefits of Pilates in their performance, it is definitely a good work out for everyone! This article from verywellfit.com gives a great overview of best diet choices when practicing Pilates. Pilates involves a lot of work on the core and mat. Many people wonder what and when to eat before doing Pilates exercises. There is no special diet for Pilates. However, there are a few things to consider about food choices as you prepare for your workout. Since there is so much emphasis in Pilates on using your abdominal muscles, you will want to have a fairly empty stomach. Your core will be fully engaged and it’s best that you have eaten only lightly at your last meal. You will probably tolerate it best to have a small snack an hour or two before your class. Another consideration is that you need to eat so you have good energy for your workout. If you skip breakfast or it’s been too many hours since you’ve eaten, you may run out of energy in the middle of your workout. It’s best to eat at least a light snack. To fully take advantage of Pilates as a mind/body fitness method, you will want to take a look at what kinds of foods keep you feeling the most balanced. Avoid anything that will make you gassy or you know will give you a queasy stomach. 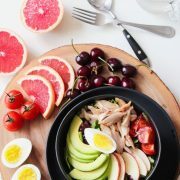 Complex carbohydrates and lean proteins, with a little high-quality fat, are good choices for a pre-Pilates meal as they sustain energy better than simple carbs or sugary things. A protein shake that uses fruit can be a convenient, light choice. You can adjust the portion size to suit you. Yogurt with fruit or a small portion of oatmeal can provide complex carbohydrates. Peanut butter on whole grain bread or on fruit in another quick option with complex carbs and protein. Pilates is light to moderate intensity exercise and does not usually create a need for special sports drinks, but you will want to be hydrated. Water is always a good choice. So it isn’t sloshing in your stomach, drink a large glass of water 90 minutes to an hour before class. Your body will have time to eliminate the extra and you’ll start off well-hydrated. Have a bottle available to sip during class when you feel thirsty. You want to make sure your body has enough of the nutrients it will need to strengthen your muscles and replenish your energy. Have another protein smoothie after class or light snack that includes protein as well as carbohydrate. Your diet between workouts will depend on whether you have a goal of weight loss or you simply want to eat what is best for your body. While you can use Pilates plus cardio exercise as part of a fat-burning workout program, experts note that few people lose weight from exercise alone. You will need to work on reducing your calorie intake overall. Doing Pilates can inspire you to fuel your body better with nutritious food while eliminating empty calories. That can have health benefits whether you wish to lose weight or not. Choose a diet that follows the current U.S. Dietary Guidelines. Which Pilates Method is Best, Mat or Reformer? The first time in any fitness class can be a bit intimidating, but, for some, Pilates can appear to be complicated and overwhelming. This could be due to the Reformer and its straps and springs or the dozens of exercise names and terms of which you’ve never heard. Don’t let uncertainty keep you away from the Pilates experience—it offers so many benefits to your body no matter your fitness background or age. Pilates will improve your posture, help you focus on body alignment, and give you an amazing core workout. Since Pilates mat workouts and Reformer workouts provide similar benefits, it’s no wonder newbies (and even regular Pilates students) are often confused about which form is best for their fitness goals and abilities. Working against resistance is essential to the 500 classical Pilates exercises, which are designed to train the body’s “powerhouse:” The abdomen, lower back, hips, and buttocks. But you can accomplish that using either a mat, where your own body weight creates resistance, or a Reformer, where pulleys and springs create resistance. In fact, the Journal of Sports Medicine and Physical Fitness published a 2016 study that confirmed eight weeks of Pilates classes improved abdominal endurance, flexibility, and balance. The Reformer’s many attachments increase the range of modifications that can be made to the exercises and allow additional exercises beyond what can be done on a mat. 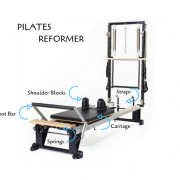 Reformer equipment is built with a sliding carriage and adjustable springs to regulate tension and resistance. Cables, bars, straps, and pulleys allow exercises to be performed from a variety of positions, even standing. The resistance created by the pulley and spring system can provide a more challenging workout than mat classes. It may also produce visible results sooner: Arm, leg, and abdominal muscles can look firm and defined within a dozen or so regular sessions. The Reformer’s many attachments increase the range of modifications that can be made to the exercises and allow additional exercises beyond what can be done on a mat. This capability, combined with the support afforded by the resistance the machine provides, allows those with limited range of movement or injuries to safely complete modified exercises. The Reformer works to lengthen while strengthening the muscles, rather than building bulk, making it an effective, non-impact stretching and toning program safe for the joints. Reformer Pilates is also great for rehabilitation purposes because the exercises can be done lying down. For example, someone who’s had knee surgery or a knee injury will be able to strengthen leg muscles through a larger range of motion using a lighter resistance than their own body weight—speeding up recovery through controlled movement. Someone with scoliosis may find it difficult to work on the mat, but they can increase their range of motion safely and effectively on the Reformer. Mat work can be a great starting point because of its emphasis on learning how to control your muscles and get in tune with your body. Exercises like the 100s where straight legs are lifted off the ground and the upper body curls off the floor for an arm-pumping series of inhales and exhales, warms your body and engages your core muscles. Other mat exercises, like the teaser or rolling like a ball, are practiced by beginners and devotees alike to work the entire body. While doing Pilates on a mat instead of a reformer may not seem as fun or challenging, many students see improved strength, posture, agility, and flexibility—including toned muscles—in just a few weeks. Advanced mat classes will use your body for support meaning more attention and effort is required when working without the assistance or support of the Reformer. So, what does that mean? Mat classes offer a greater challenge for your core muscles. Creator Joseph Pilates never intended for mat work or the Reformer to stand alone. His approach was integrative—combining mat and Reformer for the best overall program to provide the full benefits offered by Pilates. You really can’t go wrong no matter the method you choose, but keep in mind what you learn on one informs your body on the other. Challenge yourself to explore new exercises on the mat or try a Reformer class. You may just find it opens up your body in a whole new way. Bern Pilates is a fully equipped STOTT PILATES Studio. We offer private, semi-private, and group Pilates sessions. The studio features state-of-the-art MERRITHEW equipment—reformers, cadillac, stability chairs and barrels—which allows our instructors to tailor a program that benefits individuals regardless of their activity level and fitness goals. We welcome all fitness levels, from beginners to seasoned athletes and everyone in between. Our mission is to promote a strong mind and body connection all while developing long, lean muscles, core strength, cardiovascular endurance, and flexibility in a safe environment. Call (252) 514-4430 or visit us online at www.bernpilates.com for more information and class schedules. 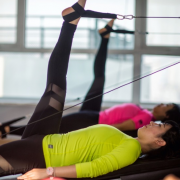 https://bernpilates.com/wp-content/uploads/2018/06/Women-on-Reformer.png 546 650 4l2jd http://bernpilates.com/wp-content/uploads/2015/11/BernPilates-340x156-01.png 4l2jd2018-06-01 16:42:372018-07-12 11:05:38Which Pilates Method is Best, Mat or Reformer? Thinking of trying Pilates? There is a ton of talk out there about this magical practice – and what it can and can’t do. Will it make you taller? Is it like yoga? Is it mostly stretching? Let’s break down the talk and get to the truth. Myth 1: Pilates is for Women only. I hear this constantly. Let’s set the record straight – Joseph Pilates (a man) initially created the workout for men (soldiers in fact). Is it grunting, weight lifting or Crossfit? No. Is it strength combined with stretch? Yes. The act of stretching doesn’t appeal to as many men as women, and therefore more women tend to practice than men. But, it is a full body workout. 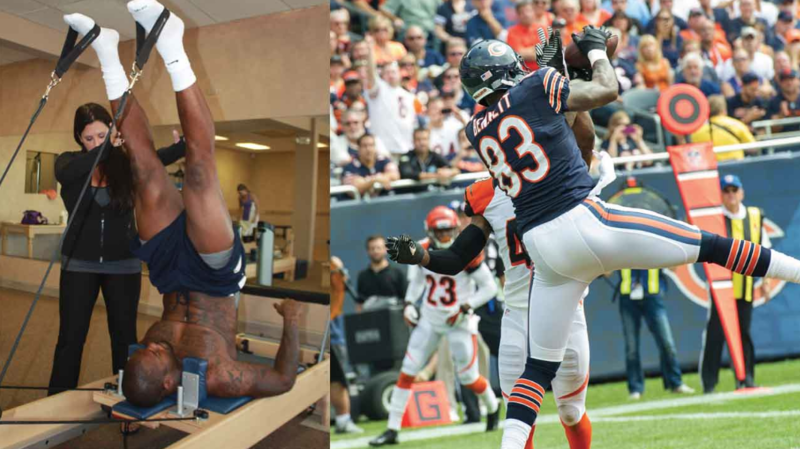 Just about every pro athlete practices Pilates. If that isn’t masculine enough for you, I don’t know what is. Myth 2: Pilates Is a Good Way to Lose Weight. No Pilates studio has ever hosted the Biggest Loser competition. That’s because it’s not interval training, cardio or heavy weight lifting – which is more widely associated with weight loss. Pilates will create muscle tone. And lean muscle burns calories during rest, so truly it can help you shed some unwanted pounds. Not a lot, but some. Pilates does create a toning effect. The combination of stretch and strength elongates the muscles – making them toned, pliable and resistant to injury. Plus, the improvements to posture visually improve your body shape. Translation: Pilates creates muscle tone, helps whittle your middle (a little bit), improves posture, prevents injury and keeps you looking and feeling long and lean. Myth 3: Pilates is just like Yoga. Pilates and Yoga are like cousins. They’re part of the same family, but they are quite different. 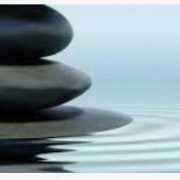 Both are mind-body exercise practices, meaning they focus on breath work and movement with purpose. (Most well executed exercises should be with purpose also, but what I mean is that there is a lot of focus on recruiting the proper muscles, positioning your posture in a specific way, breathing with exertions, etc) However, that’s about where the similarities end. There are so many different flavors of yoga that you’re getting something quite different when you try different styles – Hatha, Vinyasa, Ashtanga, Yin are just a few – and they are quite different from one another. With Pilates, you will see a consistent thread among all teachers and classes. Furthermore, when you apply the apparatus to your Pilates practice, you conjure a full body, strength-based workout. Great for osteoporosis prevention and bone density building, the Pilates springs create a weight lifting equivalent that don’t tear muscles. Myth 4: Pilates Makes you Taller. Total fabrication. Pilates instructors aren’t magicians! The apparatus have a traction effect, which gently pull the vertebrae apart, releasing any compression placed upon the discs. The disc compression is what makes a spine “shrink” or contributes towards “slump” posture. When you alleviate this compression, you are able to stand as tall as you were born to stand! For many with poor posture, continued Pilates practice will make you look taller. For everyone else, you will certainly feel taller, but the measuring tape likely won’t change. Myth 5: Pilates is only for your Abs. I certainly make the joke that “Pilates” must translate into abdominals in some language, but it is a full body workout. Mat repertoire is far more core-centric than the apparatus, mostly because it’s hard to challenge your appendages without the use of props, i.e. free weights, the ring of fun, etc. The apparatus are loaded with springs and make for a great well-rounded workout for your whole body. The core (abs, back, inner thighs) will stabilize you in every movement, so yes, it is always a core workout. But thanks to the springs, the apparatus will challenge your shoulders, arms, legs and any other part you can think of! In summary, Pilates is an amazing workout. You can do it anywhere (Pilates mat repertoire) or if you have access to a full studio, it’s even better. The mindful movement of this technique will build strength and flexibility. The main benefits from regular Pilates practice are reduced / avoid chronic pain, increased core strength, improved posture, more flexibility and strength. If these are the goals you’re after, Pilates is for you. And that’s the truth. Bern Pilates is a fully equipped STOTT Pilates Studio. We offer private, semi private and group Pilates sessions. For more information, call the studio to sign up for an evaluation and start a class that’s right for you! 252-514-4430. 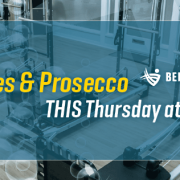 Join us on Thursday, July 20 at 6pm for Pilates & Prosecco! Enjoy a one-hour mat class followed by a glass (or two) of Prosecco! This is a fun way to learn about Pilates and enjoy an evening out with some friends. Class size is limited, so signup online today! $15 includes class and Prosecco. © Copyright Bern Pilates. All rights reserved.